If only I cared more. If I was a good food blogger, I’d take the time to ensure decent pictures of the food I blog about. If I was a good food blogger, I’d take the time to put together a real recipe. But alas, some days I am just too hungry to take the time for nice pictures. Some days I just go with the flow and throw things in a pot and cook them and am pleased with the results. Above is one of those results. It started out as stewed okra & tomatoes. 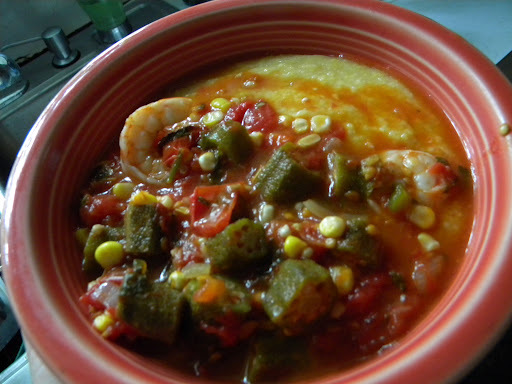 I threw in a jalapeno from the garden and minced garlic with the onion, some fresh corn cut off the cob, fresh thyme & parsley a few minutes after the tomatoes, Old Bay and shrimp after cooking the okra for a few minutes and served it on a bed of grits. I measured nothing, as is my habit. Everything about it was just right though. I’ve always seen rice recommended to be served with stewed okra & tomatoes, but after giving grits a try, I think that’s the way I’ll be serving it from here on out. They were a much better foil to the sauce. I know people steer clear of okra because they think it’s slimy. It’s true, when you slice it, it is slimy. Cooked however, it loses that quality and becomes a thickening agent. Fresh okra is the only way to go. I prepare it exactly four ways all summer long: stewed in gumbo or with just tomatoes as seen above, battered & fried and pickled. I hear it’s tasty roasted on the grill and I intend to try it that way as well one of these days. It’s a pretty plant to have in your garden – it gets tall and the blooms resemble hibiscus. Just be sure to plant a good bit of it, as once you get the taste for fresh okra, you’re hooked. And pickled okra in your bloody mary’s is quite good. Our friend gave us some fresh okra from her CSA share and we deep fried it, but it turned out slimy. Not sure where we went wrong. I'll have to try it in a bloody mary. Your okra stew looks good. Yum. Need to try this next week! Maybe Patience didn't roll her okra in corn meal/flour mix or something before frying? Curious that it was slimy. I hope she tries the pickled okra in her bloody mary! We're all fond of okra and tomatoes with any add-ins as you favor. Never tried it with grits, but will next week. YAY, okra!